In a time of strained budgets, government officials may want to take note that WIC dollars translate into cost savings in government health spending. The Special Supplemental Nutrition Program for Women, Infants, and Children—better known as WIC—has been shown to reduce long-term spending on government health programs by improving health outcomes for participants. Boosting WIC program participation may help the government save money. WIC is a federally funded discretionary spending program; therefore, participation may be limited by annual funding established by Congress. Each state’s available annual funding is determined by the state’s share of income-eligible infants and children age 1 to 4. WIC does not require state matching funds and, in recent years, nearly all eligible applicants have received benefits, reflecting Congress’s desire to fully fund the program. However, not all families who are eligible apply for benefits. The U.S. Department of Agriculture, Food and Nutrition Service administers WIC by providing states with grants for supplemental foods and services. States use these grants to supply vouchers that program participants redeem at authorized food stores for certain nutritious foods. WIC coverage (the number of WIC participants divided by the number of WIC eligible) varies considerably by state. In 2009, state coverage ranged from 45.9 to 76.3 percent, compared with a national average of 60.9 percent. WIC coverage can vary for several reasons, including outreach, stigma, point of access (e.g., are new mothers encouraged to sign up while in the hospital), and ease of access (e.g., location of WIC offices, ease of redemption of benefits), to name a few. The five states with the lowest WIC coverage rates are Montana (45.9 percent), Utah (47.3), Colorado (48.5), Idaho (50.7), and Illinois (50.8). The five states with the highest WIC coverage rates are Vermont (76.3 percent), the District of Columbia (76.2), California (73.7), Minnesota (73.5), and Maryland (70.5). You can scroll over your state on the map below to see what WIC coverage was in 2009. 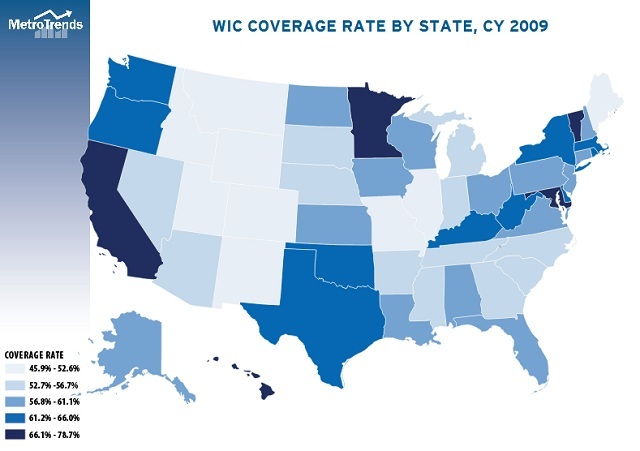 In addition to each state’s WIC coverage rate, the map reports each state’s rank (highest = 1), the number of WIC-eligible and WIC-participating people, and a 90 percent confidence interval for the coverage rate estimate. Figure 5 of the recently published brief WIC Participants and Their Growing Need for Coverage presents this information with error bars ranked from highest to lowest coverage rate.